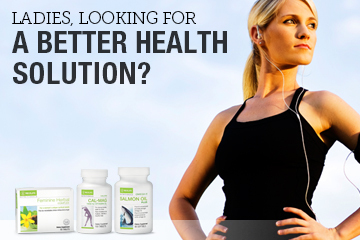 Ladies, Looking for a Better Health Solution? Warning to the men reading this—you may not want to know, but it’s great to be educated about women, so let’s get REAL! By nature, there are some issues that primarily affect women that men never have to deal with—menstruation and PMS, pregnancy, lactation, postpartum depression and menopause, just to name a few! In addition, ladies need to be aware of their risks of osteoporosis because women are four times more likely than men to develop osteoporosis. Research from the National Osteoporosis Foundation (NOF) shows that about half of women will break a bone due to osteoporosis, and the number of fractures in women is greater than the number of heart attacks, strokes, and cases of breast cancer combined! In this day and age, women have so many responsibilities from raising kids, taking care of aging parents, to contributing financially to their families–they can easily find themselves stressed, not getting enough sleep or exercise and not able to get a regular healthy balanced diet. NeoLife nutritionals can help support women through all stages of life, whether it’s immune support, bone and joint health, cognitive health, cardiovascular health or even getting to a healthy weight. Dial in to hear Clarissa Perez-Pacheco, Director of Product Management, share how the proper whole food nutrition can help ladies live their best at all ages! It’s A Bird, It’s A Plane, It’s A MOMPRENEUR!